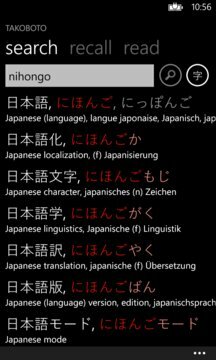 Takoboto is an offline Japanese - English, English - Japanese dictionary and Japanese language learning tool. It includes translations of some words in French, German and Russian and displays example sentences, kanji information and conjugated forms for each word. Japanese words can be searched using kanji, kana, romaji or latin alphabets. Full sentences and conjugated forms are also recognized. Kanji can be searched by selecting multiple radicals. Favorites and history and lists help remember studied words. And a Japanese text reader for advanced learners is also included. 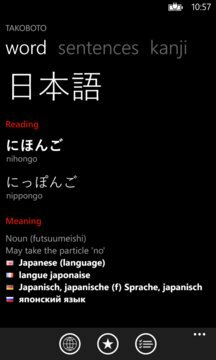 Like most of the Japanese dictionary apps out there, the data is from the awesome JMdict project made by the Electronic Dictionary Research and Development Group thanks to Jim Breen and others.